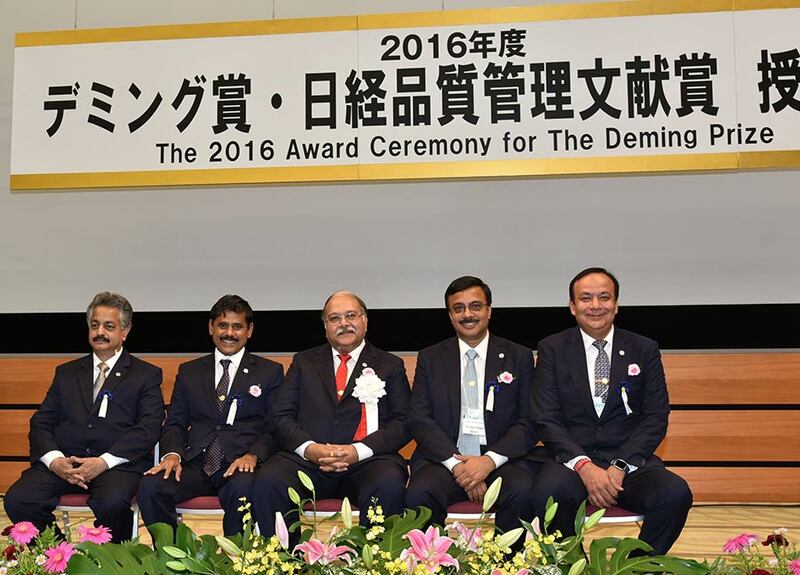 Ashok Leyland, flagship of the Hinduja Group, today received the prestigious 2016 Deming Prize for Pantnagar manufacturing facility. The Deming Prize is a global quality award and is the oldest and most widely recognized quality award in the world. This prize is awarded to companies that have established TQM in their business operations. Ashok Leyland Pantnagar has become the first truck and bus plant in the world and also the only CV manufacturer outside of Japan to win the Deming Prize. It is indeed a proud moment for all of us at Ashok Leyland to receive this coveted prize. Being the first Truck and Bus Plant in the world and the only CV manufacturer outside of Japan to win this prize, adds another feather to company’s achievements of delivering industry firsts. Housing the latest technology and processes, our Pantnagar plant is a fully-integrated plant capable of manufacturing all future-ready products across trucks and buses. Consistent quality, technology, innovation and robust processes are the pillars which have helped us garner international recognition, customer satisfaction, and help us deliver on our brand promise of ‘Aapki Jeet, Hamari Jeet’. We at Ashok Leyland have always focused intensely on quality processes and customer oriented approach with efficient people management. With large and strategic investments in technology and quality, and a young and energetic workforce, the establishment of the Pantnagar plant was an important step in our ambition to become a world-leader in the global commercial vehicle industry. Being the youngest plant of Ashok Leyland, it is a great pleasure for us to be recognized with the prestigious Deming Prize 2016 for excellence in TQM. Our Pantnagar plant has set a benchmark that we have to live up to and strive continually to reach higher goals and conquer new frontiers. The Deming Prize was established in 1951 by Japanese Union of Scientists and Engineers (JUSE) to honor W. Edwards Deming, who contributed greatly to Japan’s proliferation of statistical quality control after World War II. The selection procedure of the winner involves a tedious process. It is a very intense and time consuming effort both for the company and the examination body. The Deming Prize Committee views the examination process as an opportunity for ‘mutual-development’, rather than an ‘examination’. The applicants are not provided with any criteria or issues to be addressed. They are expected to identify and address important issues based on the business objectives which in turn allows quality methodologies to be further developed. Every factor such as the applicants’ attitude toward executing Total Quality Management (TQM), their implementation status and the resulting effects are taken into overall consideration before the final winner is decided.